Diode laser with coupling optics. 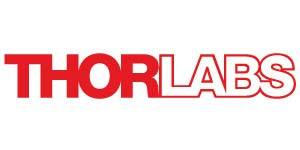 Thorlabs is a New Jersey based manufacturer of photonic tools and systems that offers a wide range of products from optics and opto-mechanical positioning components to sophisticated optical imaging systems. Thorlabs serves the needs of researchers and engineers worldwide; including the investigators of novel optical problems, designers and of users of optical apparatus of all kinds, and educators and businesses who harness the power of photonics. Customers include the National Labs, universities, medical research facilities, commercial laser companies, the military, defense companies, and both large and small photonics manufacturers worldwide. Optek is official partner of Thorlabs in Latvia and delivers their products benefiting end-users with local support and service. In our own scientific and development work we use mostly Thorlabs products and are really satisfied with their quality and durability. 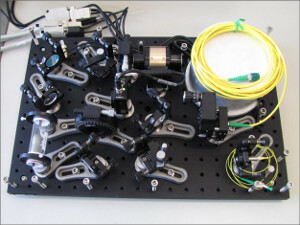 One such example is shown in the image on the right – optical system consisting of stabilized 780 nm ECDL laser and a frequency reference Rb cell. We have also delivered and installed many advanced Thorlabs products, such as extra large optical tables, optical coherence tomography systems, etc. All scientific institutions in Latvia use our delivered Thorlabs products, as well as Tartu University, etc. For more information on Thorlabs and pricing visit www.thorlabs.com or contact us at info@optek.lv.